The Cleveland Agora first opened its doors on February 27, 1966, in Little Italy, near the campus of Case Western Reserve University. The brainchild of Henry LoConti, a successful jukebox repair business owner, the Agora provided a mixture of local and well-known bands and rapidly outgrew it's small facility. Within a year the Agora had relocated downtown near the Cleveland State University campus. It would soon became one of the premiere clubs in the country, hosting many of the top artists of the day, as well as the popular local and regional bands. At one time, both Billboard Magazine and Rolling Stone ranked it as the number one Rock Club in the country. Capitalizing on the success of the Cleveland Agora, a second Agora opened up in Columbus,Ohio across from Ohio State University in 1970, and achieved similar success. This proved to be only the start for LoConti's Agora, and by the end of the 70's the Agora had branched out into a chain of 1,000-seat clubs that stretched across 10 states, including Florida, Texas, Georgia and Connecticut. In 1968, the Agora built the very first in-house recording studio, producing records, live broadcasts many of which became official album releases for the groups. In 1971, the Agora started airing their concerts on 9 stations in the state of Ohio, later adding stations in Erie, Pennsylvania and Atlanta, Georgia. Originally broadcasting the concerts live, they eventually began taping the concerts and editing them down to 1-hour shows. ABC's "King Biscuit Flower Hour" would air the shows nationally. In 1978, the Agora produced their very own television show, "Onstage at the Agora." The shows would air at 11:30PM on Saturday nights and simulcast on WMMS-FM. Many of these shows eventually aired worldwide through syndication. Kiss was on stage opening for guitarist rory Gallagher. Drummer Peter Criss' rising drum stand was engulfed in smoke, and Criss was asphyxiated. Criss fell fof the drum riser and was taken offstage by a roadie. He was sent to Charity Hospital by ambulance. Kiss finished the song without him. They never forgot their Agora gig and vowed never to play a club again with low ceilings. For the next several months, Rory's concerts at the Agora will be the focus of the "Boot of the Month," starting with his rousing performance there in September of '73 and finishing up with concerts held at both the Cleveland and Columbus Agoras in '82. 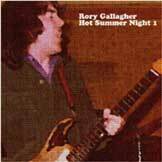 It's a hot summer night at the Agora, and the smoke rising to the rafters won't be from the lame pyrotechnics of a second-rate support band, but from Rory's blistering guitar solos that threaten to set the stage on fire. Click HERE to read an article abut Rory's visits to the Agora from the December, 1975 issue of the 'Cleveland Scene'.